Since he only need stable and cheap vps server for his forex activity he want me to give my opinion. Is he can build his own forex vps server that also easy to use like Windows. I agree to answer and promise him to make a post for his question when time permit. After 2 weeks when I have time I start test possibility of using other operating system other than Windows as Forex vps. I came with conclusion : Yes, he can. He can build his own server and I think the server is stable too. I ever run meta trader 4 on Ubuntu OS smoothly. I just need lightweight Ubuntu based OS that close to Windows. Google lead me to Zorin OS. This linux distribution came with pre installed Wine (windows emulator). At the time of writing I use free Zorin OS 9 lite. 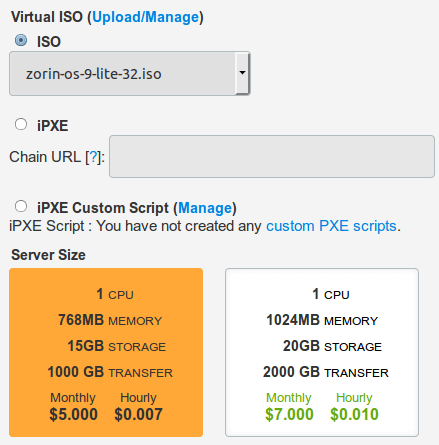 I use Vultr, even they not exclusively provide vps for forex purpose but since they provide access to custom iso and their parent company already familiar with game server and its connection sensitivity. I obviously stick with 32 bit version and choose zorin-os-9-lite-32.iso from one of sourceforge mirror. Upload the iso file using provided link (right click and copy location file). When upload process complete you’ll see zorin iso in the uploaded isos list. Ready to use. For server type I choose ‘performance series’. This series came with 100% SSD storage and 3+GHZ CPUs. For location you can choose 14 location but the rule of thumb for decision is location of broker. Broker usually provide many location. Choose closest server to your location and broker if possible. If your broker located in Germany and you live in Asia then You can choose Frankfurt,DE as vps location. Remember, your vps server will talk to broker vps server more often than you. You only need access to VPS only when you need to set EA, monitor its run and update it when necessary. For server size just choose cheapest one ($5/month or $0.007 / hour). Click Place Order and your server will be set automatically. The installation step is easy like install Windows. You choose your location, timezone and partition. You can watch the video installation for exact process. Make sure to remove attached iso file from server after OS successfully installed. By default Zorin OS will use DHCP setting. That mean you’ll use ip address automatically assigned by server. Since you have static ip address from Vultr you must set it manually. Watch the video below to see how to set ip address on your vps server. To get ip address, netmask and gateway like the one in video you can click IP4 section on your server area. In this video you’ll see how to install meta trader 4 on your fresh installed vps server. In this video I use meta trader 4 for general purpose. If you have specific meta trader 4 from your broker you can install that version. You also able to install meta trader 5 if you want to. 2. Download your EA, save it in your preferred folder. 5. Restart your MT4 and see your EA under experts category. As you see the whole process is not complicated. The server is stable and support quick restore using snapshot facility (its free during beta phase). You also can minimize the cost by use the server only in profitable days (in some case profitable EA work well in Monday – Wednesday, you can turn off your server by put it in snapshot and destroy the server). By set the ip address setting to DHCP you can deploy it easily. You can try it yourself and let me know if you find a problem as I’ll try it and update the post. 1. Beside location, what parameter should I concern? Latency, in nutshell is term for how quick connection made between your forex vps server to forex broker server. If you get lower than 150 ms (without packet loss) then you get stable server. 2. How do I know which Ip address my broker use for ping purpose? – fire up your meta trader 4 and check using command netstat. Find ip address that use port 443 (secure connection). – or you can install meta trader provide by broker and use their demo server for ping (click scan button and you’ll see ping number from that utility). 3. How about anti virus, do I have to install it? No, basically You are using Linux OS to as your forex vps. Most of known virus designed for Windows operating system. No need to worry about virus while maximize your forex vps server memory. 4. I already choose USA based location for my forex vps (New York). Do I have to reinstall it to optimize connection for my broker server (its located in German)? You don’t have to, most of VPS server use USA based routing facility. In harmony Forex broker also have many server and they interconnected. To server their client better. They will auto assigned nearest server to your point. But if you think the server full or stability is more good in nearest location (like Frankfurt, DE) then you can install new server. 5. I have several account in one broker. How can I get different shortcut for MT4? Use this trick. For first MT4 install as usual. After installation complete rename shortcut file on your desktop. Launch the installer for second install, this time add number at the and of folder. Rename the shortcut to reflect the number and so on. At the end of installation MT4 you’ll end with several folder that associated with its own folder. 6. In Windows based forex vps I can set MT4 to start automatically by drag it to start up folder. How to achieve same result in this linux based forex vps? For each MT4 instance you want. 7. How many MT4 instance I can run in my forex vps? From my experience each MT4 instance in this forex vps linux based consume around 100MB/each. So far I’ve try around 5 MT4 instance simultaneously. 8. How do I remote my forex vps? Simply login to Vultr and click link ‘Manage Server’, click on Console link to view your server and do anything you want. Then you can use remote desktop client from your windows to start control your vps. 9. How do I know about my server uptime? Type : w or uptime and hit enter key. You’ll see how long your server already work and its up time. 10. How do I know how many memory and its corresponding process. Like task manager in Linux? 11. Did you ever try it for 5 MT4 ? Yes, I did for my friend request. See screenshot. 12. Have you try other linux distribution other that Zorin that also easy to use? Yes, for latest try I use Lubuntu . This distro lighter than Zorin in my opinion also memory/ ram friendly. (I recommend use LTS version). 13. I’m not interested in trading but I do like to handle the server for fun, is it possible? Sure, You can use this link to get free $20 vps credit (for new account only and limited time). Schema 2: Set $5 forex vps so you got 4 vps server same as above that you can sell for half $15/server/month (total $60 for handling 4 vps server).